On September 26, 2015, Pope Francis joined the ranks of world leaders who have visited Independence Hall and the Liberty Bell to reflect on the contemporary resonance of the ideals expressed in the Declaration of Independence. The English translation of his address, provided by the Vatican, has been added to our documents collection. 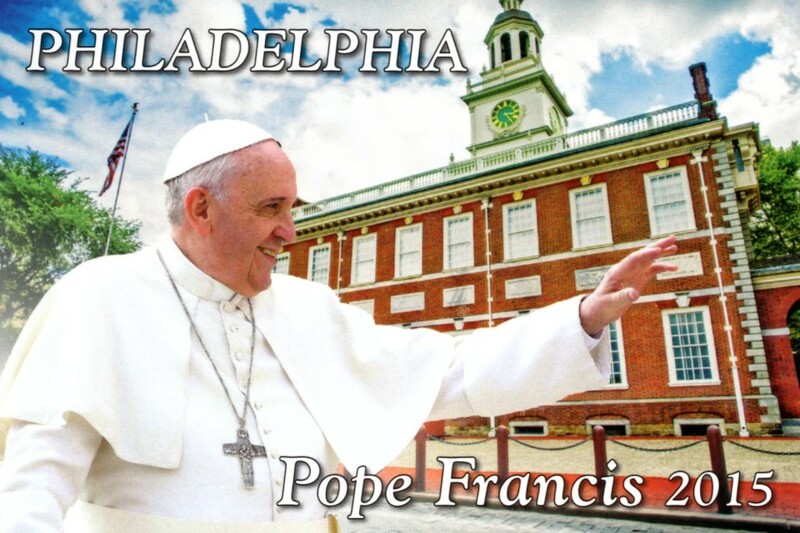 A postcard peddled by a vendor in Philadelphia anticipated the visit of Pope Francis to Independence Hall. More than three years after its dedication, the President’s House site in Independence National Historical Park remains plagued by structural and mechanical issues. Read an update by the Philadelphia Inquirer’s Stephan Salisbury here, and see the postscript to the President’s House Case Study. Requests for Fall 2014 courses? If you are considering teaching with Independence Hall in American Memory in the fall, I welcome suggestions for additional documents or case studies for this website. Just send an email to cmires@camden.rutgers.edu. Thanks for your interest! The paperback edition of Independence Hall in American Memory is now published, well in advance of the publication date previously stated on Amazon.com and the Penn Press website. If you are considering course adoption, feel free to contact me with any questions or if you would like to request additions to this website to support your teaching. Email Charlene Mires at cmires@camden.rutgers.edu.